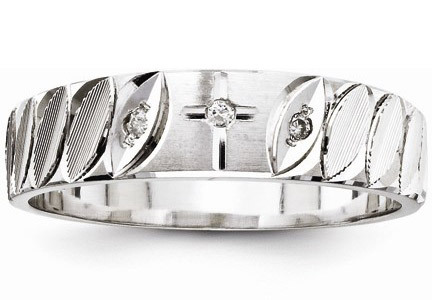 A uniquely crafted Christian cross wedding band for men set with three diamonds, representing the Father, Son, & Holy Ghost. Diamonds weigh a total of 0.03 carats and are H Color, I1 Clarity stones. 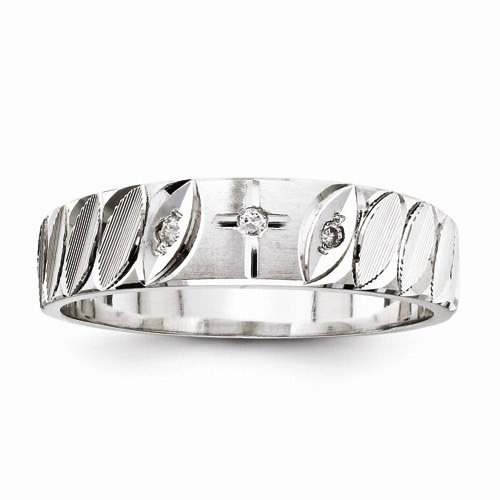 The cross wedding ring is made in 14k white gold. Matching women's wedding band is also available (shown below) as well as a matching bridal engagement ring set. Available in men's sizes 8-12, including half sizes. All jewelry from Apples of Gold also comes with our signature 45-day return policy & 100% satisfaction guarantee. Apples of Gold is a Christian-owned company that believes that Jesus is Lord and is the only way to heaven! We guarantee our Diamond Cross Wedding Band for Men, 14K White Gold to be high quality, authentic jewelry, as described above.